If you’re interested in acquiring a leading position in the culinary arts, you may want to set your sights on the position of executive chef. An executive chef maintains full creative control over multiple restaurants. What Is an Executive Chef? An executive chef is a chef that manages the menus and culinary offerings of multiple restaurants. The executive chef will dictate how items on the menu are prepared and change items on a regular basis. An executive chef may run any number of restaurants and will usually do so with the aid of a head chef who governs each individual restaurant. Executive chefs have many years of experience in the restaurant industry and with the culinary arts, and will often work very closely with the owner of the restaurant to create a unique flavor or theme. Executive chefs need to be very talented and knowledgable about flavor profiles as well as recent trends. The culinary arts are a fantastic area for those seeking job stability, and while the Bureau of Labor Statistics doesn’t list the profession as one that will experience significant growth in the next decade, it does show that it is a profession that offers significant pay rates compared to the amount of education and training required. An executive chef usually has a significant amount of creative freedom. The executive chef will create the normal menus, seasonal menus and special menus for a restaurant and will train staff members on the preparation of the items. Executive chefs are often constantly creating and testing new recipes. Rather than work in a single restaurant, an executive chef is usually responsible for a chain of restaurants. Sometimes the restaurants will have entirely different types of cuisine, demanding more creative input. The executive chef needs to have leadership skills and will need to work very closely with head chefs. They should be able to train people effectively and may need to work long hours to head all of their restaurants. Regardless, the position of executive chef is extremely sought after. How Do You Become an Executive Chef? The first step to becoming an executive chef is usually to acquire experience in the culinary arts. An executive chef maintains full creative control over multiple restaurants. Most executive chefs will have training at an accredited school of culinary arts. Many of these programs will run only two years and there are part-time and accelerates programs for those that have special considerations. According to O*Net Online, few culinary professionals have an Associate’s Degree or Bachelor’s Degree. Some professionals may undergo an apprenticeship. An executive chef will often have upwards of five to ten years of experience within the industry. An executive chef usually needs to network within their field to identify the best opportunities and to be trusted with the amount of responsibility the position requires. Overall, executive chefs need to be extremely dedicated to their craft and need to show their own unique style through their creations. An executive chef requires talent as well as skill. How Do You Advance as an Executive Chef? Many consider becoming an executive chef the pinnacle of a culinary career. From this position, the only true opportunity for advancement is to open your own restaurants or open progressively higher profile restaurants. Executive chefs need to be extremely consistent in the quality of their menus and cuisine if they want to open truly desirable restaurants. 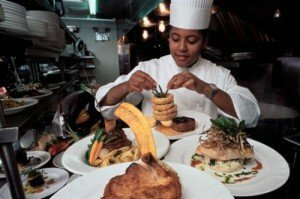 An executive chef interested in opening their own restaurant or line of restaurants will need to develop a reputation within the industry for unique creations and culinary masterpieces. Acquiring Michelin stars are an excellent way to do this.